Holy crap WTF Valcron teaching when did this happen!? Well, I'm bored and a couple people have asked how, so let's get down to business shall we? Now I'll let you all know this, I've never made a tutorial, so there are easily bound to be better tutorials, I'm only going to cover some basics. We'll start with basics. It's all about pixel placement, I'm probably going to say that at least 100 times, so remember it. I myself start with the black outlining. Making your sprite is almost like making a miniature picture, so we'll think of it that way. 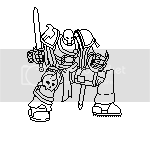 That is the sprite drawing in process, I go pixel by pixel for accuracy and stuff. That is the finished black line sprite. Nothing fancy, just a mini drawing pretty much. Now the drawing is all about pixel placement as well. You can have the best coloring technique ever, but it matters not if your lines look like a 2 year old made it. 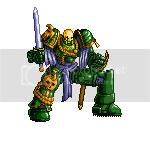 Sometimes though, some pixel artists don't even make the black lines, they just make the sprite piece by peice. I think it's easier to to make the black lines first, so you know what your doing. Next is basic coloring and shadows. Use a flood fill tool to fill in your areas. Make sure you fill all areas and leave no white in your sprite. As you see, there is a lot more depth now, and the sprite pops out much more, but this is not the extent of the sprite or what the final product will be. Shadows has a big impact on the placement of pixels. Same with the best coloring but worst lines, your lines this time can be the best around but without successful shadows it will fail. Make sure shadows are consistent and make sence. Don't make a shadow facing left on one leg then one facing right on another UNLESS there is a light source on both sides of the legs (or on the inside). That is a big no no. make one consistent light source. Next is antialiasing. This confusing word basically means: anti-aliasing is the technique of minimizing aliasing (jagged or blocky patterns) when representing a high-resolution signal at a lower resolution. Truthfully it makes a sprite look all the better if you learn the right techniques. See how much better it looks with the right shadowing, lighting and all that? That is the final product for me. Now I'll talk about some of the things that many newbie spriters *such as what I did at one time* do. Contrast, there needs to be at leasst a noticable difference between shades of color. You cannot have three shades that are just slightly different, not only is it hard to see the shades, but it also makes the sprites look flat and bland. Let me tell you, some of the stuff some guys I've seen do is amazing, and just because of the shading. Only if you know what your doing can good shading save you from bad lines. But you best well know what your doing! Next is lighting. Along with the shadows comes lighting, some sprites don't need it, but it can make a world of difference if used in the right way. Shines of armor, highlights of skin, all of it makes a key difference in your sprite. As you can see in mine, the shines give a metalic-esque *not perfect mind you* feel to the armor. The lighting gives the sprite life. And AGAIN its all about placement of pixels, place em' wrong, and everything goes wrong. Now I know there are flaws with this tuturial, this is my first, and pretty crappy at that. It's a guide to making scratch sprites anyways. Hey, lemme cover some smaller, but important still issues. Recoloring. THIS is a big no no. Recoloring a sprite requires no effort, and a green Mega Man is not a new character. Just about any spriter can tell you that. Please don't recolor, for the sake of my own sanity. Editing. This is a big part of spriting for many of the spriters, new and old out there. Editing is basically taking a normal in game sprite *Megaman best example* and giving it new features not in the normal sprite. Such as Mega Man, give him a wolverine head and claws and you have a Wolverine Mega Man. Usually spriters keep the edited sprite in the same style the sprite was originally in. There is nothing wrong with editing, I've done it once *I believe ...* and allthough it doesn't take as long, making a successful edit that looks like it cam from the game itself is always oh so satisfying. Public Domain Sprites. These are sprites people have release for public use, so long as you give credit. I myself NEVER release anything public domain, meaning if you take my sprites and use them, I won't be a happy camper. At all. Be sure to ask someone to use their sprites if they don't release it PD. So many times do I see some newbie take a sprite then try and claim it as his own, then just get shot down by the original owner because the owner didn't like that. It's kinda like if you have a signature character, and someone just starts using him 'as their own' and decides you don't exist, I don't think you'll be very happy either. Well that's all I can think of. I'm not even sure this was very helpful, all I know is I made my first crappy tutorial. Whether it's crappy or not, though, is up to the viewers. Edit: If no pictures come up, lemme know. not bad valcron, but i think if you were aiming for newer pixel artists you should have made a section on how to clean the line art. as for crits on the guy, he is very good, but his left leg is about a head too long. Well tell the truth, I never use line art, I make mine pixel by pixel like I said. Usually that's how it's done in most cases, unless your going for a fighting sprite, then using a drawing is probably the best bet for a more accurate sprite, but I have no experience there, so ... yeah. Also, I'm not gonna take time to explain this much. Have you seen some of the older, more ornament space marines? There's no physically possible way it's just only a man in a suit of power armor, more like they're in a mech. 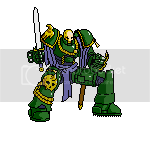 That's kinda the way I built Chapter Master Tauron here, he has no legs, so the bottom half of him is robotic. If you've ever seen the cover book for the Space Marines for WH40K then you'll know what I'm talking about, because that guy on there is so huge it's scary. Most of the bigger guys like mine are more like in a mech suit than in just armor. 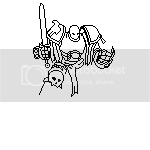 what i meant for the line art bit, was stuff like not having jagies and how to make smooth curves using pixels, if you have a look at my pixel art avatar tut on this site you should get what i mean. Nice sprite you've got there. i spritenow and then, but mostly fire emblem style, more fun to animate. Good tut!